Brian Reid, Philip McCallen and Derek McGee. Three names you don’t expect to see in the same sentence but, perhaps you shouldn’t be surprised when you do. In the history of Irish Road Racing only three riders have ever won three championships in the same season. Brian Reid, Philip McCallen and Derek McGee. Sounds less surprising reading it the 2nd time doesn’t it! Derek’s 2017 season wasn’t all plain sailing either when you factor in bringing his Supertwin out again after a year lying up, refreshing an aging Yamaha R6, and changing his Superbike to an MSS Superstock Kawasaki ZX10. Opening his Supersport season with a win in Skerries Derek began banking valuable points on both the Superbike and Supertwins in Walderstown and Faugheen and looked forward to a down to the wire fight with close rival and Superbike veteran Derek Sheils at the Killalane circuit in North County Dublin. Disaster struck in Dundrod at the Ulster Grand Prix where a racing incident left Derek with a fractured femur just 4 weeks before the final meeting. A hectic schedule was planned with visits to the hyperbaric chamber in Cork with the hope of being passed fit to race. After an exhaustive treatment with many visits to Cork, Derek was deemed fit to race. 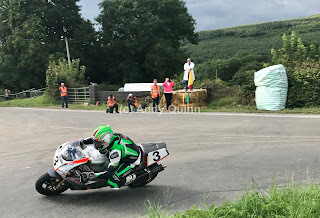 With the Supersport and Supertwin championships already won, all eyes were on the Superbike title which was blown open by Derek Sheils omission at Armoy. A three way battle ensued between both Derek’s and local rider Micko Sweeney. Knowing a 3rd place would be enough, McGee didn’t take any risks securing the 3rd illustrious championship. A sensational year for McGee equalling the career highs of Brian Reid and Philip McCallen. There were some tremendous battles along the way and it’s a season that should be remembered for many years to come.